We have developed computational methods to measure historical significance through analysis of Wikipedia and other data sources. We rank historical figures just as Google ranks webpages, by integrating a diverse set of measurements about their reputation (including PageRank, article length, and readership) into estimates of their fame, explained by a combination of achievement (gravitas) and celebrity. We correct for the passage of time in a principled way, so we can fairly compare the significance of historical figures of different eras. Our book Who's Bigger? 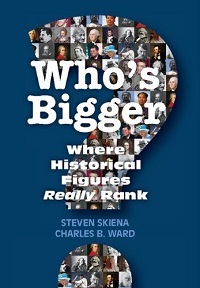 : Where Historical Figures Really Rank (Cambridge University Press, 2013) describes our analysis and uses it to study a variety of issues from the effectiveness of human decision processes (like recognizing the most appropriate members of a Hall of Fame) and the underrepresentation of women in the historical record. We also identify the most significant figures in dozens of interesting domains, selections which will illuminate most readers but infuriate others. This website presents the complete data underlying our book. For every person in Wikipedia (a population similar to San Francisco), we present where they rank according to all underlying variables as well as our combined metrics. We also integrate data to how often they appear in books published each year, so one can watch their reputations rise and fall. We also present analysis from tens of thousands of groupings, so you can see where each person ranks in each crowd.